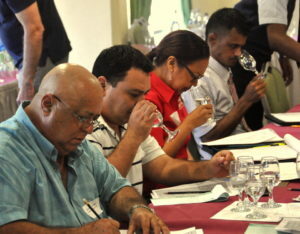 Seminar Programme: Working with a technical team of regional practitioners, WIRSPA implements technical seminars based on the expressed needs of producers in areas of rum production. Under this programme some thirteen seminars and workshops have been held over the last 5 years. The seminars also serve as a useful forum for interaction between the supervisory/technical and managerial staff of the several distilleries and as a platform to introduce new technologies. Training, Study Missions & Internships: In addition to the seminars, individual producers took advantage of in-depth attachments hosted in producer facilities or at overseas institutions. Tailored events such as study missions and internships were geared to respond to the individual needs of producers, utilising centres of excellence within the industry, and if necessary, further afield. Technical Support: Taking advantage of the considerable regional expertise within the sector, WIRSPA facilitates a quick response technical support service aimed at provided real time practical support for smaller producers in particular as well as longer term technical advice. Knowledge Sharing: WIRSPA maintains an Intranet Portal to provide members with collaborative workspaces, online document libraries, contact information, events and links which are continuously added to. WIRSPA has developed a Best Practice Guide to Caribbean Rum Production which is a dynamic compendium specific to regional best practice. Additional materials are published within the scope of the category education campaign for the ACR Marque, such as reports on the rum market and material of interest to trade influencers. Research & Joint Areas of Interest: WIRSPA facilitates activity in areas of common interest to producers, including standards development, quality assurance and product testing. A continuing focus is the procurement of molasses, the primary raw material for rum and a high cost input – both the possibility of joint procurement by groups of producers (especially the OECS) and improving the trade regime for extra-regional molasses. This is an increasingly critical issue for producers due to the falling production of sugar in the region and therefore availability of molasses. Benchmarking the industry: WIRSPA has been pursuing an initiative to share performance data among members in an attempt to benchmark relevant performance indicators for the industry. The data collection effort has been in place for five years now for basic production data and will be expanded to increase the scope of coverage. Environmental Compliance: Over the past decade, significant investments were made by producers to improve waste disposal and general environmental management. WIRSPA continues efforts to promote increased environmental compliance through raising awareness, exposure to new technologies and sharing of experiences.